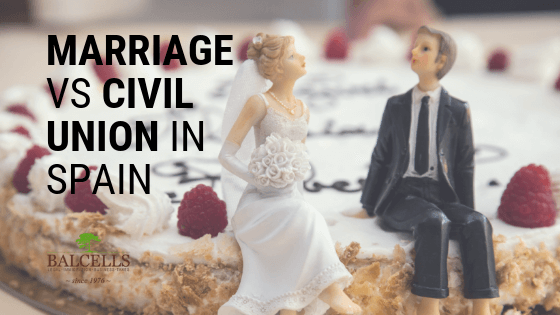 What is the Difference Between Marriage and Civil Union in Spain? After a while living in Spain, many legal duties will start to appear. You may have a child, you will need to pay your taxes, register with many institutions… and, if you a have a partner, your legal relationship with her or him can affect all of these processes. But, luckily, you have the possibility to extract some benefits out of your relationship, if you exactly know what is best for your interests. But then, we must ask ourselves: for this purpose what should I choose, marriage or civil union? In this post, we will clear your mind and expand on the main differences and similarities regarding both options. Are you ready? WHAT IS BEST, CHOOSING MARRIAGE OR CIVIL UNION? Marriage and civil partnership are both legal status given by the government to couples. In this sense, there are many differences and similarities among both options, and determining what is better for you will depend on your specific situation. That is why in this blog post we are determined to make sure you understand what each kind of legal relation involves. Civil union and marriage are both regulated by the family law in Spain, and they will both certainly benefit you in order to be better protected in many situations, like having children with your partner. Furthermore, they will grant you the possibility to regulate many economic conditions and make them explicit, which is something we really recommend. If you are planning to face an important event in the upcoming months or years, like buying a property with your partner, starting to live together or having children; choosing either one option or the other is something you should consider doing. But the question is, which are the main differences between Pareja de Hecho and marriage and how can they affect my decision? As mentioned before, the two options have some shared legal aspects as well as important differences you should consider. We will start with the commonalities. First of all, by choosing any of the two options you will be able to explicitly regulate the economic regime between you and your partner. Being able to determine how your possessions and gains will be distributed in terms of legal property is something really worth it. There is one difference, nevertheless, between the two legal types of relationship here: in order to define an economic regime between you and your partner, you explicitly need to do it in the notary in the case of the civil union; whereas with the marriage you can avoid this step. In this sense, there are two possible economic regimes in Spain: the regime of community of acquisitions and the separation of property regime. You can learn more about what both options imply here. Once you have your legal status conceded by the corresponding authority, you will be granted the right to receive the widow’s or widower’s pension in case of the death of your partner. That is something given to marriages just after the moment of constitution, but the competent legislation demands certain extra requirements for parejas de hecho. In order to be granted the widow’s/widower’s pension, the civil union must have been constituted for two years before the decease, and both members must have been living during 5 years together. You will be able to adopt a child. And, with some of the changes that were applied recently in Spain, nowadays homosexual civil unions do have the right of embarking on the process of a joint adoption too. Both members of the relationship will enjoy the same rights and obligations in regards to their common children in case of a family breakdown. Just as a note, it is not easier to get married after having a child: the requirements are still the same. Even though they can be very similar in many ways and imply the same rights, constituting a Pareja de Hecho or a marriage in the Spanish territory also poses some differences. Understanding these discrepancies will be key in your journey to better defining what best suits your current needs. This is one of the main differences as it is the one that determines the upcoming ones. The civil union and the marriage are not regulated by the same codes and laws in the Spanish territory. Whereas the latter is regulated by a statal law, the Spanish Civil Code; the former from the corresponding regional code. For example, civil unions in Barcelona and Catalonia are regulated by the Catalan Civil code. This has many important implications, as depending on where we live, going for the marriage can be more beneficial than the civil partnership. This is why we advise you to contact us in order to further analyze your situation and determine like that the path that best adapts to your concrete situation. If you live in Catalonia, we really suggest you read its Civil Code, as it is just 2 pages long and it clearly explains all the obligations that each partner will have once the Pareja de Hecho is registered. Well, because there are many conditions that you may not be expecting, like the need for one of the two members to provide food to the other one if this last one is not currently working. The distinction in terms of the application and constitution process may really interest you, especially if you are an expat or foreigner living in Spain and wanting to constitute a legal relationship. Basically, constituting a civil union is much more simple and fast than constituting a marriage. It will take just 15 minutes on the notary for you to have your Pareja de Hecho, whereas it can take from 1 to 6 months to finally have your marriage registered. And, as we have mentioned, foreigners may have it much more complicated, because the competent authority will require from them a lot of documents from your country of origin. If you want to save time and have your partnership settled fast… go for the civil union. For that purpose, we recommend letting our specialized lawyer team help you with the legal procedure. We have helped hundreds of clients constitute their Pareja de Hecho, and our efficient mechanism will let you have your legal status handled as soon as possible. Nevertheless, it is true that marriage just requires the consent of both members on the notary (and with 2 witnesses) in order to proceed. Pareja de Hecho, apart from that, will also demand that you and your partner have lived together for a minimum of 12 months. One of the main benefits of marriage that a civil union won’t grant you is the possibility to do a joint taxation. This will, for sure, save you and your partner a lot of time. If you constitute a Pareja de Hecho, both members will need to do their individual taxations separately. What happens if both members decide that their relationship is over? In that case, and if the relationship constituted was a marriage, the unfavourable member of the two will have the right of compensation from the counterpart. In 100% of the cases. In the case of a civil union, just some regions have written in their civil codes this right, thus accept it. In those regions in which there is no right to compensation pre-established, it will be a judge who must agree on the right of compensation during a trial. In the situation in which marriage has been constituted, there is an implicit right for the inheritance. On the contrary, Parejas de Hecho need to agree on the validity of inheritance by drafting a will. You have just constituted a marriage or a civil partnership. You are vey happy and want to celebrate with your loved one. The joy is such, that you even plan a vacation together. That will only be possible in the case of a marriage. If you have constituted a civil union in Spain… you do not have the right to do holidays. This have been the main differences between both legal paths. As you can see, there is no option better than the other one, and choosing a marriage over a civil union will only depend on your current situation and what you value the most. For any other concrete doubt regarding any of this points, do not hesitate to ask in the comment section down below, we will be glad to help you! Thank you for a clear description of both ways to legalize a relationship. In either case, the right partner surely helps.